Andy Coughlin will make his Wrexham debut in Wednesday's trip to Stockport as regular keeper Joslain Mayebi is on international duty. Mayebi is with Cameroon for their 2013 African Nations Cup qualifier against the Cape Verde Islands on 14 October so he will miss Wrexham's next two games. 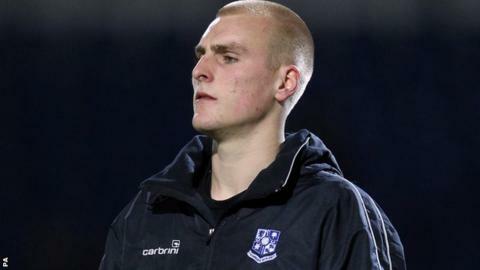 Teenager Coughlin, a summer signing from League One Tranmere Rovers, will have a first chance to impress Wrexham. "Andy will have to come in and play," said Wrexham boss Andy Morrell. "He's done great and he deserves the opportunity. He's come on leaps and bounds in training in this first couple of months so he gets his chance and we'll see how it goes. "He makes a lot of good saves in training, he's great to have about and I've told him that we are pleased with him." Rob Ogleby missed Wrexham's 2-1 weekend win over with an ankle injury but the striker may return on Wednesday. The third-placed Reds, who are currently six points behind leaders Newport County, are 11 matches unbeaten and will leapfrog Forest Green into second if they beat Stockport.